Oprah Winfrey and Dr. Mehmet Oz (whose new book indicates beautiful people are perceived to be more competent and more fun, get paid more, and have more relationship success) recently dedicated an entire show on ways to be more beautiful. They consulted 25-year industry veteran Paula Begoun, who shared her "shopping guide for face care," in which Olay was a top choice. 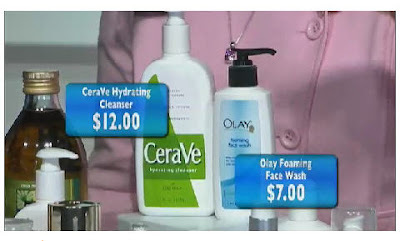 Paula recommended the Olay Foaming Face Wash as a gentle, inexpensive cleanser that's "beautifully done" and the Olay Regenerist Daily Regenerating Serum as an inexpensive moisturizer complete with the ingredients that work best on the skin. 2. Indicate if you would like either the Olay Foaming Face Wash or Olay Regenerist Daily Regenerating Serum. Winner must be a U.S. resident to enter. Only 1 product will be sent to each winner. Only 1 entry per person allowed. Multiple entries will not be accepted. Giveaway ends Monday, Dec. 1st Midnight EST! Good Luck!